WSRA provides leadership, advocacy, and expertise. The governing body of the WSRA is the Board of Directors. The Board shall have full authority to govern and establish policies and procedures to direct the business and affairs of the association. (Voting) Board members who are elected by the Assembly (WSRA members) are: President, President Elect, First Vice President, Second Vice President, Third Vice President, Past President, Coordinating Secretary, Recording Secretary, and Treasurer. (Voting) Board members who are elected by the councils are: State Council Coordinator, Central Zone Coordinator, Northeast Zone Coordinator, Northwest Zone Coordinator, Southeast Zone Coordinator, and Southwest Zone Coordinator. (Voting) The Committee Coordinator is elected to Board of Directors by the Committee Chairs. (Voting) The Legislative Committee Chair is chosen by the Legislative Committee and approved by the President. (Voting) The following are appointed by the President to the Board of Directors: Public Relations Liaison, Update Editor, and the Director of Membership. (Nonvoting) The President invites a Literacy Liaison from the Wisconsin Public Instruction to the Board of Directors. (Nonvoting) WSRA employees, Conference Chair and Administrative Assistant, serve as nonvoting representatives to the Board of Directors. The WSRA Leadership Group is comprised of local council officers, committee chairs and members, and the Board of Directors. WSRA holds four (4) Leadership and Assembly meetings (July/August, September, November, and April) around the state of Wisconsin throughout the year. See the WSRA calendar. The Wisconsin State Reading Association's members wear all sorts of hats and work to provide best practice literacy instruction across the public and private schools. Join Us! 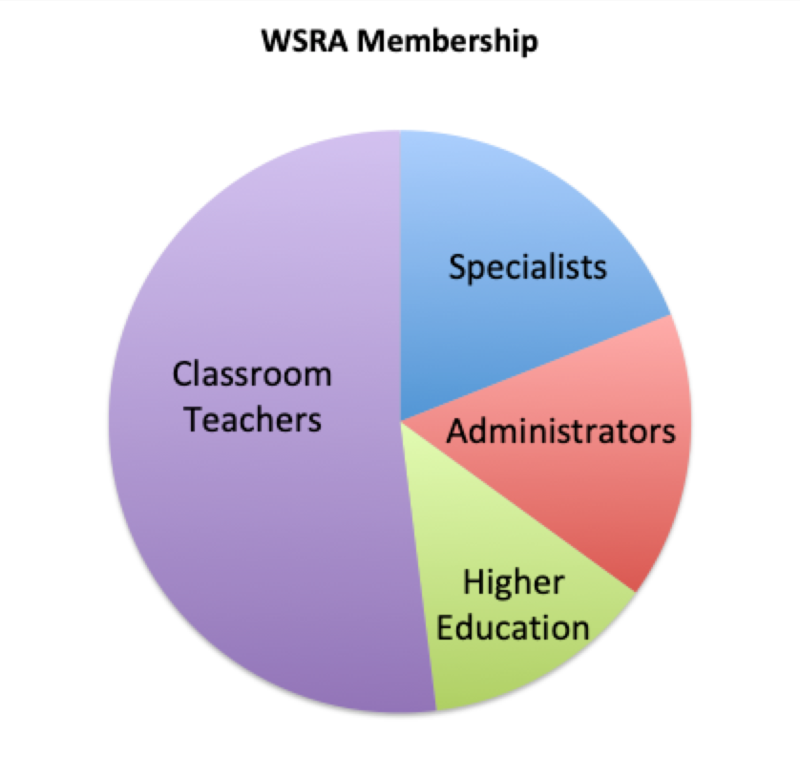 WSRA members serve the community in a variety of roles: Author, Consultant, K-12 Teacher, Reading Specialist, Reading Teacher, Special Education Teacher, English Language Teacher, Principal, Curriculum Director, Coach, Library Media Specialist, Interventionist, Reading Recovery Teacher, Teacher Educator, Pre-Service Teacher, Tutors, and/or support personnel. Wisconsin's retired teachers continue to be members as well. Membership is $37 per year. 24 local councils all around the state of Wisconsin. Provide Little Free Libraries in park campgrounds.